Victoria Tauli-Corpuz, UN Special Rapporteur on the Rights of Indigenous Peoples, says she has observed a global escalation in criminalization and violence towards Indigenous Peoples. 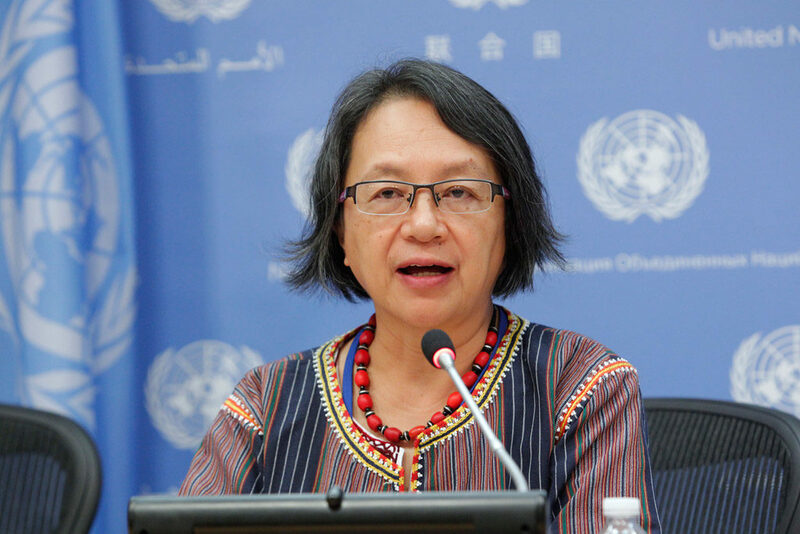 “There is a direct link between respecting collective rights to lands, territories, and resources and the solutions we need to solve the problems of climate change, biodiversity erosion, and cultural erosion,” UN Special Rapporteur Victoria Tauli-Corpuz said last month at the UN Permanent Forum on Indigenous Issues. Each year, the Permanent Forum brings together Indigenous Peoples, governments, civil society, and academics in New York to discuss the challenges and opportunities facing Indigenous Peoples around the world. The Forum then reports to the UN and advises on ways that member states can better protect indigenous rights. This year’s theme was “Indigenous Peoples’ collective rights to lands, territories, and resources.” Indigenous leaders from across the globe noted the crucial role that secure rights play in their lives and livelihoods, and in the advancement of sustainable development and climate change mitigation. Research demonstrates that where indigenous land rights are secure, deforestation rates are lower and carbon storage higher. Ms. Tauli-Corpuz noted that where indigenous land rights are respected, “this is also where we see ecosystems that are better conserved and protected.” Secure rights also have important implications for food security, poverty reduction, and sustainable development. The Forum’s final report (draft version) highlighted these crucial contributions—but also pointed to slow recognition of indigenous rights around the globe and an alarming trend of criminalization and violence against indigenous human rights defenders. Indigenous Peoples and local communities customarily claim over 50 percent of the world’s land, yet they have legally recognized rights to just 10 percent. The Forum recommended that states incorporate the UN Declaration on the Rights of Indigenous Peoples into their national legislation to help close this gap, and draft policies to implement rights effectively. Ms. Tauli-Corpuz emphasized that “focusing on the collective element of this right is extremely important. 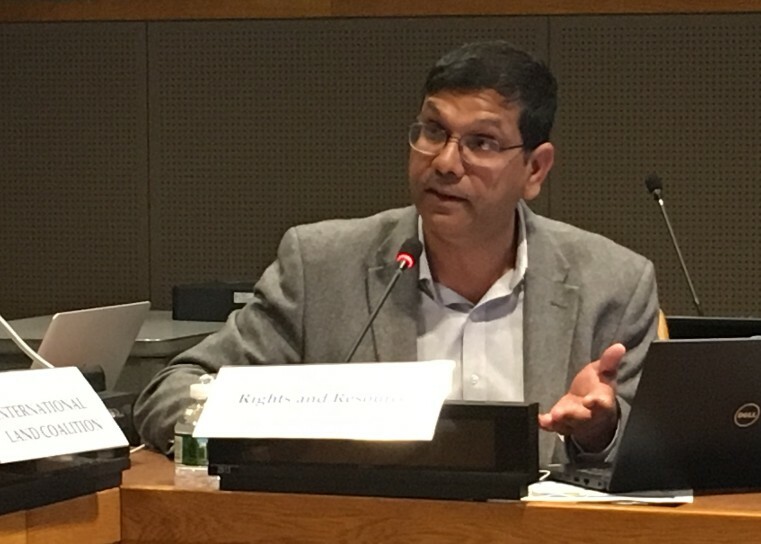 This is exactly where the international standards meet implementation challenges on the ground.” In some cases, legal systems only recognize individual rights, or governments fail to demarcate indigenous lands and territories. Where rights are not secure, Indigenous Peoples are more vulnerable to poverty, climate shocks, and involuntary displacement—and the forests they protect are more vulnerable to exploitation and deforestation. When Indigenous Peoples defend their customary lands or speak out against rights violations, they are often met with violence. In some cases, they are labeled criminals or terrorists by states. The Philippines government recently labeled several lifelong indigenous activists terrorists, including Ms. Tauli-Corpuz herself and co-convener of the Indigenous Peoples Major Group Joan Carling. These problems are not unique to the Philippines. According to Global Witness, 200 human rights defenders were killed in 2016, and 197 were murdered in 2017. Historically, 40 percent of those killed have been Indigenous Peoples. And criminalizing indigenous activists is even more pervasive. “I have observed a global escalation” in criminalization and violence towards Indigenous Peoples, Ms. Tauli-Corpuz said in her report to the Forum. Noting the many reports of criminalization and violence she receives from around the world, she is preparing her thematic report this year on the topic of violence and criminalization against Indigenous Peoples. “I never realized that I would be one of the exhibits on this subject,” she added. In the face of these challenges, members of the Permanent Forum urged governments to think of them as allies in the struggle to build a more peaceful, equitable, and sustainable world. “There can be no sustainable development without the respect, protection, and realization of human rights,” Ms. Carling said. About the author: Jamie Kalliongis is the Manager of Strategic Communications at the Rights and Resources Initiative.